When my great-aunt, Benita “Detty” McCormick reached the “young” age of 92, she created a scrapbook of her life. She devoted the first pages of her scrapbook to her parents and grandparents, Thomas Eugene and Mary Jane McGinnis; and John Patrick and Bridget Gaffney. 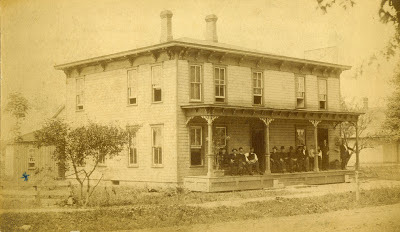 One of those pages contained a photograph (below) of the Gaffney House in Conneaut, Ashtabula County, Ohio. Located at 58 Mill Street, it was also known to some as the “Conneaut House.” The house belonged to Mary Jane’s own parents, John Francis “Jeff” and Bridget (Quinn) Gaffney. John and Bridget were Irish potato famine immigrants to America. Both were from County Roscommon– he from Drumbrick and she from Boyle. Did they know each other before crossing the Atlantic? It’s hard to say, but the towns are about five miles apart, so it is possible. It appears, though, that they married in America. John and Bridget lived for a time in Milwaukee, Wisconsin, where Mary Jane, their eldest child, was born and baptized in 1858. They arrived in Conneaut sometime between 1858 and the spring of 1860, when their second daughter, Margaret, was born. The United States 1860 Census indicates that John was a “peddler” who owned property in Conneaut valued at $300. The equivalent today would be over $8,000, an impressive amount of money for that era. Aunt Detty believed he had been a traveling linen salesman, but it seems plausible that he would have sold other textiles as well, such as cotton. The demand for cotton was far greater than for linen at this time, due to shortages of flax (needed to make linen) and the rising popularity of cotton as a less expensive and more versatile material. The demand increased dramatically with the advent of the Civil War and the need for cotton to make soldier’s uniforms and medical supplies. These factors must have contributed a decent income to the Gaffney family and made it possible for John and Bridget to afford such a large home as the Gaffney House. The house apparently was big enough to house John and Bridget’s growing family – they would have 10 children in all – plus additional rooms to rent to the young men who worked on the nearby Nickel Plate Railroad. The Gaffney House, famous Conneaut, Ohio landmark patronized especially by Nickle (sic) Plate railroad men. About 1880 the hotel was the home of more than 30 unmarried young men under the age of 27 years. + The cross on the addition indicates the window to the “Priest’s Room” built by my grandfather John Francis Gaffney to accommodate the circuit priest who came when he could to minister to the growing Irish-American population. John and Bridget had no idea that one of those young men would become more than just a “renter” to them in the years to come. That is a lot of people under one roof – even a big roof! What a great picture of the house. You're so right about it being a lot of people, Kathy. One of my sons wondered if Bridget Gaffney had to cook for all of them. That was a daunting thought!